Kieran Brookes joined up with the England squad on Sunday night, two days after coming through his Saints return unscathed. The tighthead prop played 60 minutes in the 24-11 defeat to Wasps on Friday night, making his first appearance since recovering from knee surgery. Brookes hadn’t played since sustaining an injury in the draw with Racing 92 on December 19, but he did not suffer any ill effects on his comeback. And he is now back with the national squad, replacing Bath’s Henry Thomas in the group ahead of Saturday’s Six Nations opener in Scotland. 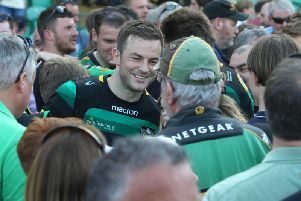 Saints boss Jim Mallinder was delighted to have Brookes back in action last weekend, but he knows it will take his player time to get back up to full speed. The director of rugby said: “You could see from his performance that he’s not match-sharp. James Wilson was another man who was making a welcome return last week. The Kiwi utility back came off the bench during the second half, getting his first first-team action since sustaining an arm injury in last season’s Aviva Premiership play-off semi-final defeat to Saracens. And Mallinder said: “It’s good to see James Wilson back. Jamie Gibson was due to join Wilson on the bench for the game, but the flanker was ruled out.